"I believe God made me for a purpose," said Christian Hackenberg in his post-game press conference, probably. "He made me fast, and when I run, I feel his pleasure." Pop the champagne. The Philadelphia Eagles' preseason is over. After dropping their first three meaningless contests, the Birds pulled out a scintillating 10-9 win over the New York Jets that will surely be discussed for centuries. As always, we hand out 10 awards. The most compelling thing that happened in preseason game No. 4 was Carson Wentz's warmup more than two hours before kickoff. I would like to reiterate my position that I think Wentz is starting Week 1. Tonight was the first time I've ever seen a head coach rest his third quarterback in a preseason game to keep him safe. 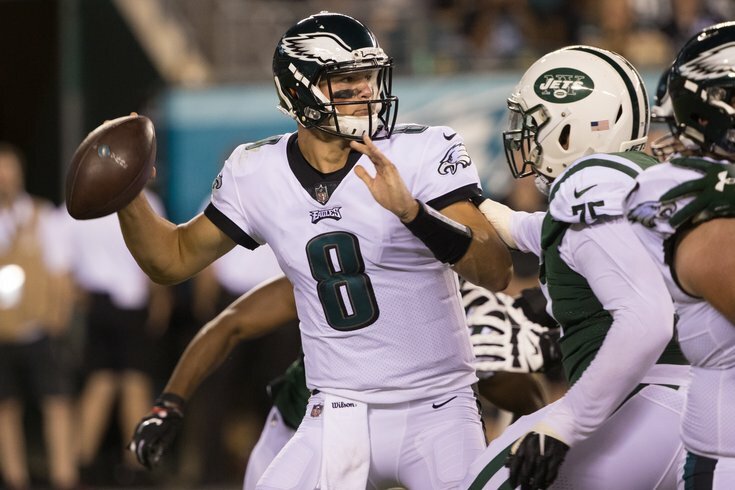 Pederson (rightfully) opted to sit Nate Sudfeld, letting Joe Callahan and Christian Hackenberg take all the mop-up fourth preseason game reps.
After a bad start to camp, Johnston had a legitimately really good preseason, booming deep punts in "blast away" situations, and placing the ball nicely in or around the 10 in "pin 'em deep" scenarios. Yes, the punter gets the fourth award of the night. Means had 3 sacks and a forced fumble against the Jets, as he was dominant (as he always is) in the preseason games. Means has had at least two sacks in all three of his preseasons with the Eagles. Yes, I actually researched this. Hackenberg threw two ugly interceptions, and just looked, you know, bad. Well, bad as a thrower of the football, anyway. As a runner with the football, he's basically a combination of Walter Payton and Barry Sanders. Hack had 65 yards on 5 carries, out-gaining Jay Ajayi, Corey Clement, Darren Sproles, Matt Jones, Wendell Smallwood, and Donnel Pumphrey this preseason. Just make him the fourth running back. Yeah, OK, I know, he fumbled once. Shut up. In the first quarter, Wheaton got wiiiiiide open on a deep post, but Callahan badly underthrew him, leading to an incompletion. Wheaton is trying to make the team, and that would-be touchdown may have screwed him. I still think Adams makes the team, but he had a pretty blah showcase game, carrying the ball 13 times for 27 yards. Pederson is going to take down a Super Bowl sign in the locker room at the request of the players, who think it's a new year and don't want to be content with past accomplishments. Does that have anything to do with this game? Well, no, but John Clark tweeted it during the game, so I'm using it. PAT to beat the Jets in the 4th preseason game, thus avoiding overtime and making me watch this game for another minute longer. The 61-yarder against the Giants.